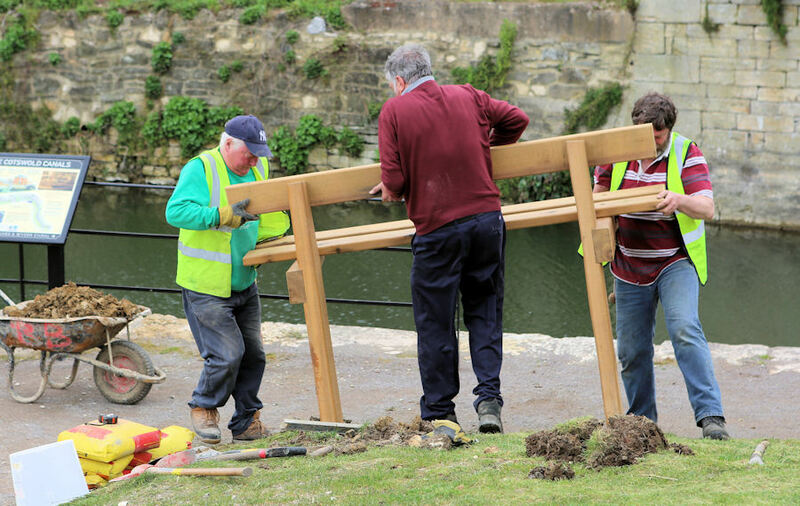 Cotswold Canals Trust Volunteers have been constructing and installing hardwood canal-side benches since 2012. 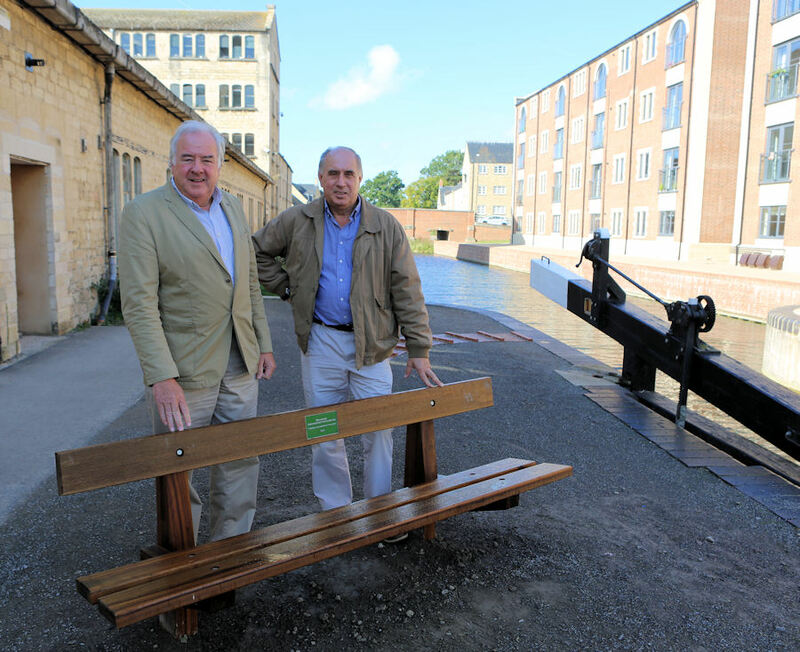 Bench number 44 was recently installed on the towpath adjacent to Ebley Mill swing-bridge. Pictured right are Roland (left) and Paul Tanner the directors of Stroudwater Redevelopment Partnership Limited. The Bristol based company provided the latest addition to the list of waterside locations where wanderers and ponderers may sit and rest awhile. 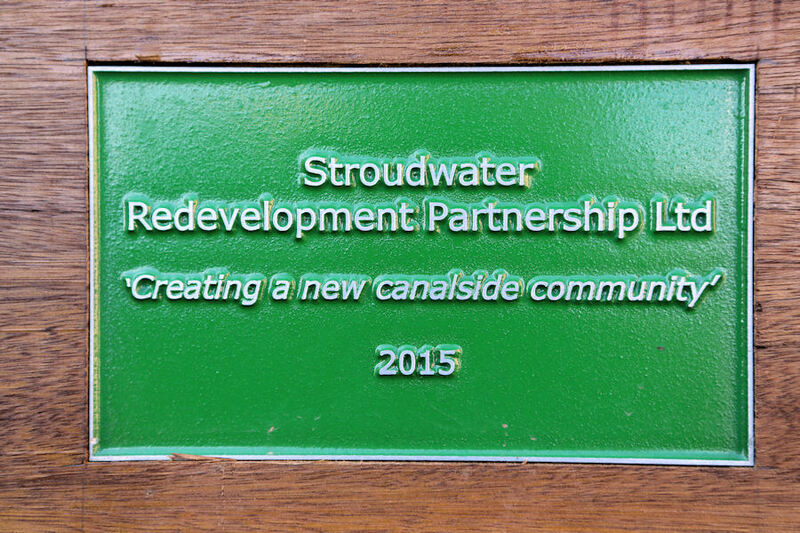 Roland Tanner said, “Stroudwater Redevelopment Partnership Limited is delighted with the outcome of the Ebley development—now in its final stages. The restored canal, river and surrounding area are exactly what we envisaged some sixteen years ago with a good work/lifestyle balance in a pleasing environment. The timber used to construct the benches is Greenheart (Chlorocardium rodiei). The tree can tree grow to a height of 40 metres (130 feet) and is native to the Guianas. Greenheart wood, which is both strong and dense, is used chiefly in Europe for underwater applications, such as pilings for docks and wharves. CCT Trading Company Chairman Clive Field explains… "The project typifies the teamwork and skills present in the Trust's volunteer force. As the restoration progresses so more locations become available. "The hard and heavy timber is machined by one team in readiness for every bench to be fitted with an etched zinc plaque, sometimes two. "The laser etching process used to produce the plaques allows for the inclusion of detailed company logos or freehand drawings significant to the purchaser. "The drawings are done by Trust member Peter Westley. We have presented some challenges to Peter during the project. He applies his artistry with accuracy and empathy. "The installation team then assembles and installs the finished bench. "Thanks to the corporate benevolence of local businessesand the care of individuals and families there are some striking results out there for all to appreciate and enjoy."